The colorful sari, the sing-songy Trinidadian lilt and soft, warm mannerisms were the same. Even the savant glasses were the same but the short afro was now vaguely salt-and-pepper. If I no longer knew her name, I knew who she was. Flashback. Summer 1989, now theater producer then history teacher Florence Jean-Louis Dupuy approached Shirley D., Leila W. and me and asked if we'd represent Haiti at a cross-Caribbean youth camp in Trinidad. I was ecstatic. The camp turned out to be a truly life-forming experience. One through which I discovered the world right around Haiti for a change. The world of VH1, MTV and all of American pop culture was already quite familiar, what with all the hipness of speaking english, listening to Prince and visiting America. There would now be life beyond Lalue, the navy uniforms and the girly mischief of sneaking lip gloss past Sister Anne-Marie. There was the discovery that people with neither European nor African descent lived in the Caribbean, that Trinidad was 40% Indian. There was the youth of Raja Yoga with whom we prayed, there was Vincent Bain Nathaniel (or was it Bain Vincent Nathaniel?) the St Lucian, there was Tony Sempere and ___ the two Guadeloupean boys whom I later saw again in Guadeloupe, and all the others I can't remember. There was the visit to the youth detention facility where we spoke about youth rehabilitation and received the trini coat of arms--or was it the Haitian flag-- encrusted in leather squares. There was peanut juice, the sweet in the cuisine, mango chutney. There was poet Eintou Pearl Spring who housed Shirley and I the first evening and who made us listen to David Rudder's "Haiti I'm Sorry". There was the middle-eastern inspired architecture. There was the striking woman walking down the street in a fuchsia tchador--not only were there Indians but there were also Muslims in the Caribbean?-- and in a Chanel dress-- apparently certain trini women liked marrying Moslems precisely because of their Chanel acquiring power, said my guide. There was the interview with Trudy --the web says Judy--Alcantara on a local channel, my first and probably last time on a TV set. Who knows which of my flashbacks were from the actual trip and which were from later internet surfs on Trinidad? It changed my life nonetheless. Seeing crinkly tresses in Trinidad on the beautiful dogla women made me set my own free. I now wanted to know all about Negritude --and Depestre's Bonjour et Adieu felt more like a sellout then,-- Bob Marley and Kassav'--okay I knew them before going but I had not been as obsessed with Guadeloupean and Martiniquan creole. Yup, this was her, the woman who had made that much needed culture clash possible. She was right here in Santo-Domingo, 15 years later. I re-introduced myself amidst bites of Dominican artisanal cheeses, pasteles and cold cuts, screaming atop the rootsy live bachata combo. Many a professional deconstructor were still dissecting the opening night speech His Excellency Leonel Fernandez had just made. Why did he talk about solidarity when he'd just expelled people for looking Haitian? Was he sincere about Caribbean integration? Would the DR join CARICOM? "Oh my goooowdddd! Come hear this, Nadine. This was one of my pupeels at the peace coomp in Chaguaraaaamass. Oh my Gooooooooowddd!" Her name was Innette Cambridge I re-learned. Except now she had become Dr. Cambridge and taught at UWI St-Augustine. Social work. And no, there was no more camp. The scarce money and all the benevolent energy had run out. But there had been several camps, some cross-Caribbean, some not. Some paying, some not. And no, contrary to what I'd told people for years, the Peace-Camp-in-Trinidad-that-changed-my-life had not been funded by UNESCO. Innette had preferred autonomy so as to program the camp freely and without constraints. Oh and she now had a son she had to raise and could no longer afford to spend her own money on the camps. She almost lost her house funding them. CSA 2005-- this year's Caribbean Studies Association conference-- took place in Santo Domingo, Dom. Rep. People from all over the world who study the Caribbean came together under the theme "Caribbean Integration in the Age of Information" from May 30th to June 5th. Figgy teaching media at the Kaibab reservation in Arizona. Photo Courtesy Melissa Nelson. Esther "Figgy" Figueroa and I met at CSA (Caribbean Studies Association Conference) 2005. She is a Jamaican linguist and filmmaker living in Hawai'i. At CSA, she talked about parallels between the Caribbean and Oceania as part of a series of seminars entitled "Islands of Globalization," a project that brings academics and professionals from both regions together to create more awareness by each region of the other. In 1985, Figgy along with Heather Haunani Giugni started Juniroa Productions, Inc., one of the first independent production companies to produce Hawaiian and local content for Hawaiian communities and Hawai'i TV. Here is a cut and paste of the first installment of an instant message chat with Figgy. We talked about feminism in both regions, how Jamaica has come to embody the Caribbean in the eyes of many in the world, Figgy's own personal beef with Puerto Rico where she lived as a teen, Caribbean studies etc. So how and why did you, a Jamaican among many other things, decide to move to Hawai'i where you have lived for 20 years now? I heard you talk at CSA 2005 about this concept of "islandness" which seems to link the Caribbean to the Pacific. Can you talk to us a little bit more about that? I'm assuming it was one of the concepts that informed "Islands of Globalization". How and why did you become involved with Islands of Globalization? How do Hawaiians and Pacific Islanders perceive the Caribbean? Doesn't the Caribbean = reggae to most of the world at this point? well i'm not sure it is the caribbean - unless the caribbean gets conflated with jamaica which i think is really a problem! i've found that most people really don't know about the caribbean at all and that they often mean jamaica - my cousin who is the jamaican ambassador to japan and serves the whole asian region has told me that the caribbean is simply not on the map - we are subsumed under latin america - well within the caribbean i think because of reggae music and other things the caribbean to a great part of the world is unfortunately subsumed under jamaica - this of course is not the case with the spanish speaking caribbean cuba - the dr - puerto rico - but they are often not even considered caribbean and get subsumed under latin america. and then of course there is the francophone caribbean and that's a whole other thing all together! So you were trained as an academic (linguistics and Chinese I believe) but chose instead to be a filmmaker. Why? 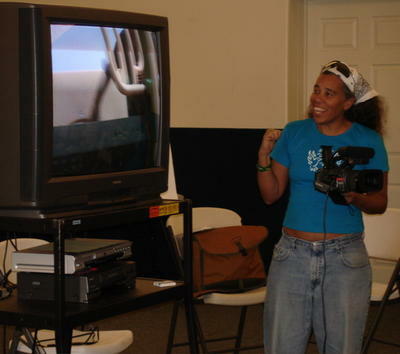 Figgy at a media training for children at the Kaibab reservation in AZ. Photo Courtesy Nicola Wagenberg. So the film company you created, Juniroa Productions, produced some groundbreaking work. How do you feel about that? So you are a pretty adventurous woman who's lived in both the Caribbean (Jamaica and Puerto Rico) and Oceania. Any observations about the ways in which each of these regions deals with feminism and women? What does your crystal ball have to say about the field of caribbean studies? would be great if the caribbean actually took caribbean studies seriously so that the caribbean was the repository and depository (instead of the universities of north amerika and europe) of all that the caribbean has given to the world - would be great if we were producing the curricula and materials out of the caribbean and that the caribbean benefited and would be great if caribbean studies was also outward looking and considered horizontal connections with regions like the pacific instead of always being in reaction to the colonial metropoli and the supposed centers of power. Please leave any questions you have for Figgy in the comments section. Chauvet's Amour: Dark Claire in small town hell . . .
New Yorker Marie Vieux Chauvet's "Amour, Colere et Folie" trilogy was finally re-published this year after decades of muzzled oblivion. The first story "Amour" is a delight and an ethnographic jewel. This is a woman-centered haitian novel written by a most adventurous writer, a controversial pioneer whose vivacious and uncensored prose angered many. 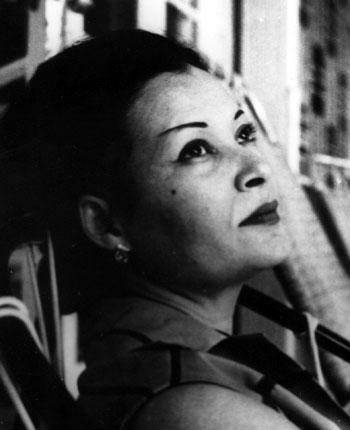 Chauvet passed away in New York in 1973, as critically acclaimed Edwidge Danticat turned 4, and almost 20 years before the launch of the Women Writers of Haitian Descent (WWOHD) collective. "Amour" is a must-read for caribbeanists who want to get a handle on post-occupation Haiti (read post-1934). It is also a good read for those French readers --nope, no English translation yet-- who like a good well-told story. The protagonist Claire narrates the prelude to the Papa Doc years as lived by a peculiarly Jeremie reminiscing southern town and its "white mulatto" bourgeoisie; that strata's women and their strategies in coping or not with sexual repression; its unease with dark-skinned upward mobility and its own downward mobility; its ambiguous relations with desirable and not-so-desirable Others including Americans, Frenchmen, Syrians and peasants; the heightened violence of the pre-Papa Doc years and so on. To her proxy-white family's distress, and despite her name's connotations, Claire has the mahogany skin of her paternal great-grandmother. Her sisters Felicia and Annette are respectively a pale blond and a barely-sun-kissed blue-eyed brunette. Claire's skin tone, a bad card dealt by the genetic lottery, contradicts generations of selective mating on the part of her ancestors. Still, Claire is the oldest and probably the smartest of her sisters, and her milky-skinned Dad has groomed her to succeed him in managing the family's coffee fields and its workers. Unlike her sisters, Claire is the sacrificial virgin who never marries, the archetypal old maid stuck in a paralyzing bind. She's respected as a seasoned oldest, enjoys a certain authority and finds herself echoing and even enforcing the clan's imagined endogamous traditions despite her own dark skin. Simultaneously, she has a hard time dealing with her sexual and creative repression and finds many of her peers' prejudices revolting. She lives out her repressed longings for escape and adventure through an obsession with Jean Luze, Felicia's French husband, a handsome world war veteran who collects music and books. Her voyeurism is her only sexual outlet and she experiences her sexuality vicariously through her sisters, particularly through Annette whom she pushes into Jean Luze's arms. I'm still working through the book's many layers so expect many more posts on various aspects of it in days to come. Unfortunately, the book has not yet been put into english but if yours truly can help it, we'll be lobbying for that shortly. (Wink-wink.) I'm well aware that Lilas Desquiron's Reflections of Loko Miwa also deals with pre-1964 massacre Jeremie but haven't read it yet so we'll have to draw parallels later. Should be fun!